We are thrilled to have found a permanent home at 318 Woodworth Avenue! Contractors asked to bid on interior work. Hope to hear back from soon! We have filled a 20 yard dumpster, and will likely fill another this weekend. Lots of progress was made in the "demolition" of Woodworth this past Saturday. Chuck headed up a crew of six people - Charlie Schnetzler, Rex Smith, Steve Hawkes, Fran and Mike Groves, and Kate Sandow - and they have essentially gotten down to the studs and original ceilings in the whole gallery area, removed about 800# of lead that was in the old X-ray room walls and ceiling, and opened the windows up on the inside (the outsides are still covered). There's a large bay window that matches the front window! 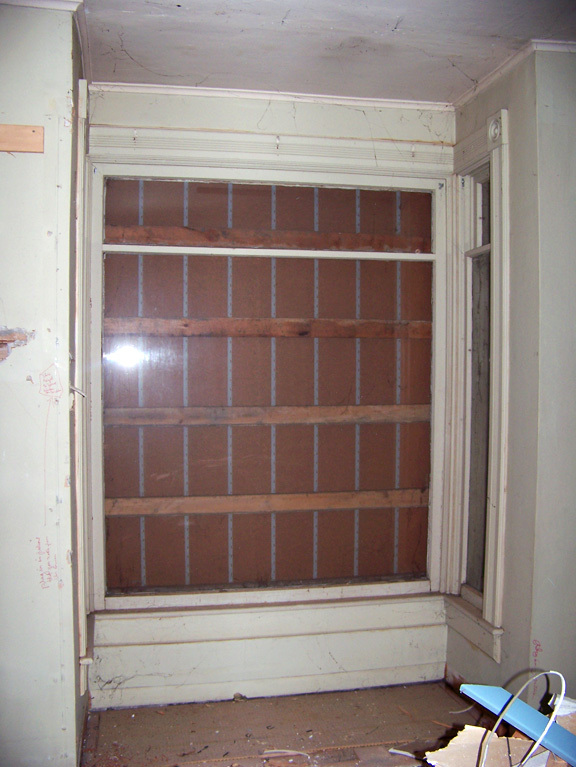 We will open up the original windows to the home, but not quite yet. We need to get more interior work done first but it is our plan to have lots of natural light available, even if we set some display panels partially in front of some to allow for back-lit displays. Chuck uncovered the bay window on the south side of the house today and it is in good shape!! 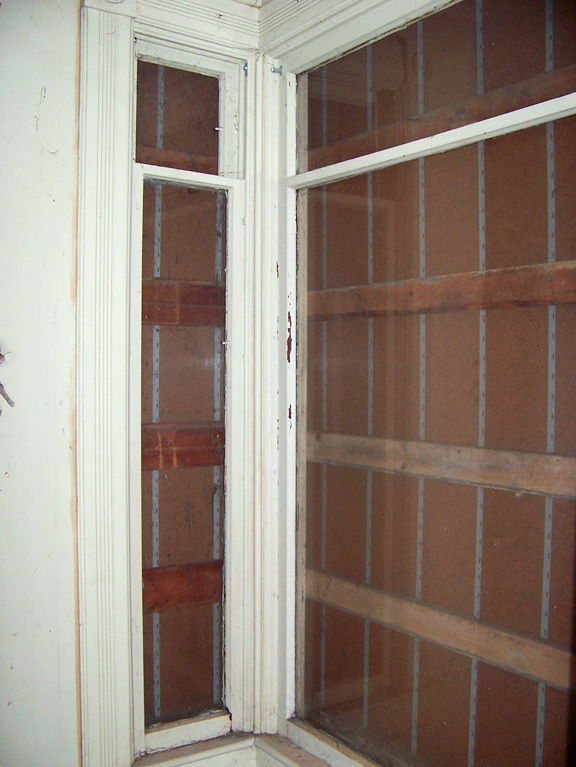 It is a floor to ceiling bay (ie: no window seat), original molding, glass, etc. which matches the front window. South facing window has a large piece of glass, probably 5' x 5', and the 2 side windows have glass approximately 2' wide by 5'. The header in the wall between the front room and the old x-ray room is not as sturdy as we hoped and will need more attention. Still more discoveries to come! Chuck has opened up some areas of the paneling and we have found a few surprises which may change some of our original design thoughts slightly. Kurt has reviewed some of the structural and mechanical issues and advised us on what direction to take. We also have a "Delicate Demolition Day" scheduled for this Saturday the 1st beginning at 9:00 am to take much of the inside front part of the house down to the studs, remove ceilings, haul scrap, etc.